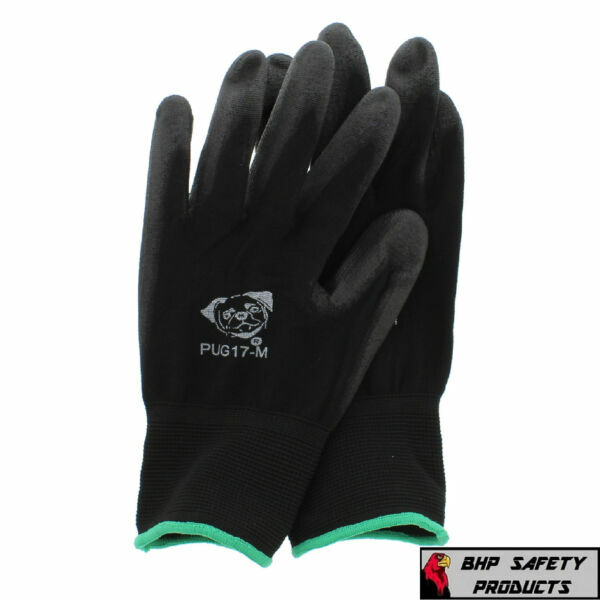 eBay Global Glove PUG17-MPolyurethane Palm Work Gloves (12 Pair) This lightweight seamless glove is a good general purpose option that features a black 13 gauge nylon liner. The shell is enhanced by a black polyurethane dipped palm and is anti-static/electrostatic compliant for use in ESD Protection Areas. • EN 388 levels: 4131 • ANSI/ESD SP15.1-2005 compliant • ANSI/ESD S20.20-2007 compliant • 13 gauge nylon shell offers bare hand sensitivity • Polyurethane dip provides superior grip and comfort • Knit wrist cuff prevents gloves from slipping off during use • Each pair is individually packaged in a polybag YOUR 100% SATISFACTION IS TOP PRIORITY! BHP SAFETY PRODUCTS main motivation is for our customers to be 100% satisfied with their purchase. If any consumer has something unsatisfactory with their product or transaction, please contact us immediately and we will do everything necessary to correct the problem and guarantee our promise. **TIME OF DELIVERY** BHP SAFETY PRODUCTS processes and ships orders Monday thru Friday 8:00AM – 5:00PM EST with the exception of National Holidays. We currently ship 93.8% of our orders the same day they are received and 99.6% within 24 hours. **WARRANTIES** We guarantee all of our products to be new and free from all manufacture imperfections. Factory defective items may be returned within 30 days of receipt. At which time a replacement will be sent at our expense or a complete refund of the transaction. **PAYMENT** We accept only PayPal **FEEDBACK** Our goal is to earn a 5 star rating from every business transaction. When you receive your product, please take a moment and post us a positive feedback. When your shipment leaves our warehouse, we will automatically post you a positive feedback! THANK YOU FOR SHOPPING WITH US!